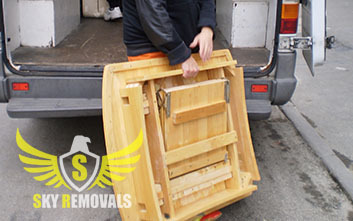 We from Sky Removals are the best option when it comes to furniture collections. We are fully insured and certified contractors and we provide services of world class quality. We are currently the company of choice of the local residents and business owners as we have proven to them throughout the years that we can handle jobs of any scale and complexity with flying colours. After all it is not by chance that we are regarded as a benchmark for quality when it comes to furniture collections in London. All the projects for which we are hired are organised and carried out by our team of skilled and competent specialists. Our employees can easily disassemble and reassemble any type of furniture, so have no worries if your furnishings are too big to fit into our vehicles. We have provided to our workers the finest instruments and protective gear, so rest assured that nothing bad will happen to your furniture during your London furniture collection project. Our armada comprises of new and clean Lorries and Lutons which are fully fitted with the latest and most reliable GPS and safety features. With the aid of our vehicles we can easily and safely transport any volume of furnishings to any storage facility in the city. \We have never had a major accident during transit due to the fact that we secure all moved items with belts and straps and cover them with furniture blankets in order to protect them from damages which are related to unwanted bumps and falls. To furthermore ease your mind we want you to know that we have full CMR insurance which means that you will get fully reimbursed in the case of an unwanted event. Also know that our accident ratio is 0%. Also know that we maintain a 24/7 customer support centre which means that you can book our services at any time of the day. Once you get in touch with us don’t be shy to ask our customer consultants to send you your personalised free quote, so that you can get a better idea of the services that we are ready to provide you and how much it will cost you. Last but not least we invite you to explore our company website in order to learn more about the other services that we provide to our clients. We are based in London, the capital of England. The city is home to several prominent landmarks such as the Palace of Westminster, Bucking Palace, London Eye, Wembley Stadium, the British Museum, St. Paul’s Cathedral, Tate Modern and many more. It is also one of the world’s most important cultural and financial centres.